Iranian Supreme Leader Ayatollah Ali Khamenei, far left, meets with President Hassan Rouhani, second from left, and other members of the president's Cabinet, Aug. 29, 2018. Iran's supreme leader has told the nation's president and Cabinet to work "day and night" to resolve economic problems that have put President Hassan Rouhani under unprecedented political pressure. 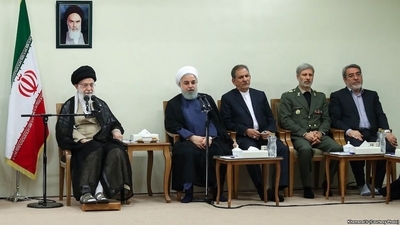 Supreme Leader Ayatollah Ali Khamenei issued the instruction in a Wednesday meeting with President Rouhani and the Cabinet, according to Khamenei's website. It quoted him as saying: "(Economic) officials must ... work tirelessly day and night, in line with policies of the economy of resistance — which entail empowering domestic production." Iran's currency hit a record low against the dollar last month as Iran faced the prospect of renewed U.S. financial sanctions, which began taking effect August 7. Iranians also have staged frequent protests across the country this year to denounce government officials and business leaders whom they see as responsible for high inflation and unemployment, water shortages and suppression of human rights. Rouhani faced lawmakers' questions about his administration's handling of economic problems at a Tuesday appearance in parliament. It was the first time in Rouhani's five-year presidency that lawmakers had summoned him for such a questioning, and they voted to reject his responses to four of the five issues they had raised. Adding to the pressure on Rouhani, reports by Iranian state media Wednesday said the parliament has begun impeachment proceedings against his education minister Mohammad Bathai. Lawmakers dismissed Rouhani's labor and economy ministers earlier this month. A Monday report by Iran's Mehr news agency said some lawmakers also have begun gathering signatures to start an impeachment of a fourth Cabinet member, Industry, Mining, and Trade Minister Mohammad Shariatmadari. In one reprieve for Rouhani, a Wednesday report by state news agency IRNA said Iranian parliament speaker Ali Larijani ruled out sending the president to the judiciary for further questioning about Iran's economic problems. Larijani said lawmakers had found no violations of the law by Rouhani's administration, violations that would have enabled them, under parliamentary rules, to refer the case to the judiciary in a step toward a potential impeachment of the president. Speaking to VOA Persian at a Wednesday event hosted by Washington's Hudson Institute, the research group's senior fellow Michael Pregent said Rouhani is under pressure because the president serves as a convenient scapegoat for Ayatollah Khamenei. "The supreme leader ultimately is responsible for what is happening with the economy," Pregent said. "The economic benefits of the 2015 nuclear deal (between Iran and six world powers) were squandered by the supreme leader's adventurism (in the region)." In a separate VOA Persian interview, James Phillips, a Middle East analyst at the Heritage Foundation, said Rouhani's administration also has made domestic enemies for trying to fight corruption. "One reason why Rouhani's economy minister recently was impeached ... is because he was involved in an anti-corruption campaign that threatened some ultra-hard liners' economic interests, particularly the Islamic Revolutionary Guards Corps (IRGC), who have their hands in a lot of pies," Phillips said. On the sidelines of the Hudson Institute event, Security Studies Group analyst Matthew Brodsky told VOA Persian that whether Rouhani or his deputies are removed from office is "irrelevant." "In the end, it is Khamenei and the IRGC who really are pulling the strings and controlling large portions of the Iranian economy," Brodsky said. "You can fire the one guy whom you are giving a really small percentage of the overall (government) budget to play with, but most of the budget is spoken for, and it is (being spent on) foreign adventures and things that do nothing for the Iranian people." The U.S. and its Mideast allies long have criticized Iran's Islamist leadership for sending money, weapons and military personnel to support militants and pro-Iranian rulers across the region. This report was produced in collaboration with VOA's Persian Service.